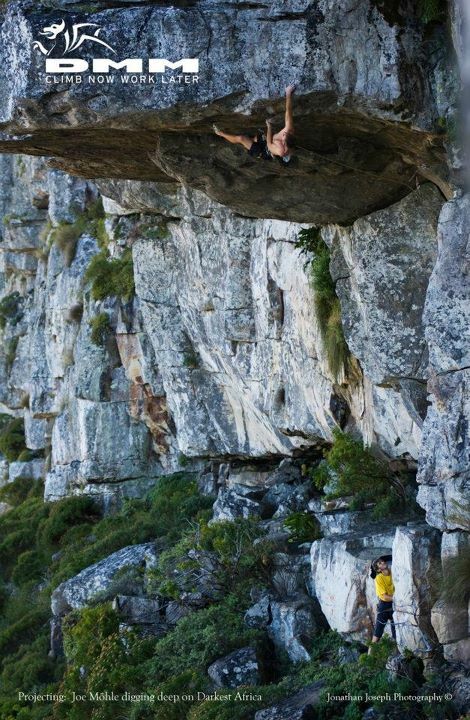 Table Mountain's Africa Ledge just received a hard new-school line courtesy of Joe Möhle. The single 15 meter pitch that is now "Darkest Africa" has been Joe's longest project, throwing countless hurdles in his way, the biggest of which was the seeping headwall. Joe is grading the line 31, although he feels it's a fair bit harder than most of the other routes he's done of the same grade. I first envisioned the unlikely line just over 2 years ago. A few months went by before I actually could piece it together and began to believe it was possible for me. I pulled out a piton (part of it belongs to an existing aid route) and replaced it with two opposing wires. This is the only fixed piece on the route, and I sent it placing all other gear. It is possible to do it placing all gear, but would be slightly more dangerous. I had to wait out two winters to do the the route because the headwall seeps. This and several trips overseas meant that I could never build up a good rythem of working the route. I came very close before leaving for Morocco and Switzerland this past summer, thanks to the patient belays by Richard "Squeaky" Halsey. I sent yesterday on what was likely my last chance before winter comes and I have to leave for Switzerland! It is predicted to rain for the 4 days in Cape Town and the route needs 5 days to dry. Phew!!! Joe is sponsored by Edelrid, DMM and Wild Country.